Two marathons will take place on Sunday 6 August with the men starting at 10:55 and women starting at 14:00. Set against some of the Capital’s most historically-significant and picturesque backdrops, the 26.2 mile route will start and finish at Tower Bridge. 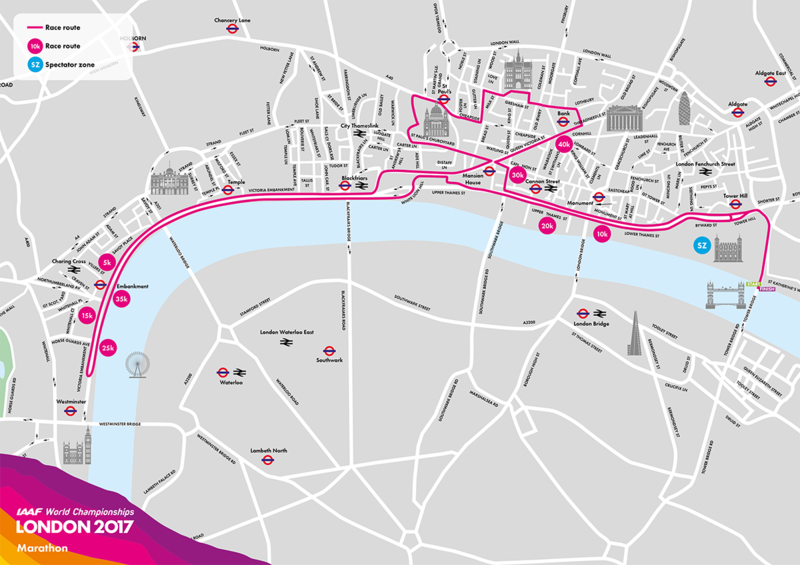 The loop course will take four laps of a 10km course on closed roads, heading west along Victoria Embankment towards the Houses of Parliament, then back alongside the edge of the River Thames to take in sights of the City including St Paul’s Cathedral, The Guildhall and the Bank of England . The loop course is hugely spectator friendly, with people being able to take up a position and watch the athletes pass four times. Within the Moat at the Tower of London will be our Marathon Spectator Area with big screen and event presentation. The stage will play host to live commentary throughout the day and showing the live footage from the course. This is open from 10am until 5:30pm. The Medal ceremonies will take place after the women’s race at 5pm. This is an unticketed area but restricted to approx. 1,700 capacity. There will be grandstand seating/ picnic tables/ deck chairs in this area as well as catering consessions. For the latest travel news and advise relating to the marathon visit the Transport for London website.